Students from a high school in Decatur, Ga. got the surprise of a lifetime last week. Southwest DeKalb High School gathered 14 scholarship applicants on April 18 to learn which one of them had been chosen as the recipient of the scholarship — they all believed there would be only one winner. But once seated, the students received an incredible surprise: They were all winners. 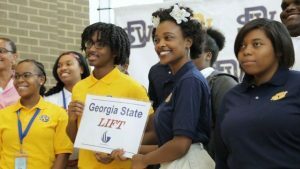 Each student will receive a full-ride scholarship to a two-year program at Georgia State University in Decatur. The scholarships, which the school said were awarded based on essays and grades, are funded by a $14.5 million gift from State Farm to make college a reality for students who might not otherwise be able to attend. An additional $5.5 million from State Farm will fund other student programs at nonprofits and schools, the university said, for a total of $20 million. Along with the 14 students from Southwest DeKalb High School, 36 other students from Decatur high schools will also receive scholarships this year. But the awards won’t just provide financial assistance — they’ll also include help for students with other issues they might face along the way. And the class of 2017 won’t be the only one to benefit from State Farm’s donation. This year’s recipients represent the launch of an ongoing program at the university called Learning, Income and Family Transformation (LIFT), which aims to help 40-50 high school seniors each year. Renick says the scholarships can be transformative for not only the families that need them, but their communities as well. “I got the scholarship from Georgia State, so everything’s going to be okay,” Southwest DeKalb High School senior Kalen Jones told her mother over the phone after learning she was a scholarship recipient.